Along the road westward out of Sydney and into the Never Never— and that’s the region north and west of Woop Woop, which you’ll find beyond the Black Stump, and that’s back of Bourke, and where you’re there you’re outback, mate — there’s a town called Nevertire, not far from Gin Gin. Scrap tires never go to the landfill in Nevertire. There, tires never get burned into smoke so thick and noxious you want wrap your head in a wet towel for relief. They never get collected and shipped into some remote jungle tire cemetery to become nesting beds for mosquitos and a source of much of the world’s malaria. 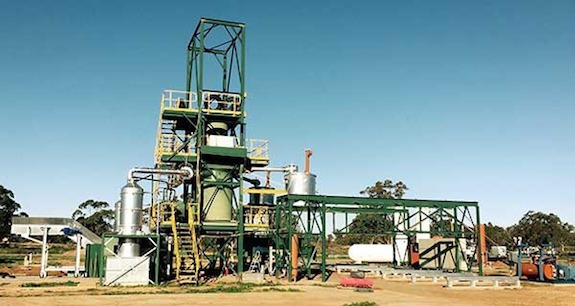 There are no tires in Nevertire because Green Distillation Technologies, some 20 clicks up the road in Warren, is operating its Destructive Distillation technology at pilot scale and is recycling used tires into oil, carbon and steel wire cord. Though operating so deep in the Australian bush you may never have heard of them, the company made a mark on the international stage in 2015 when they were Australia’s first-ever nominee in the Edison Awards, a major award scheme in innovation, and they picked up a bronze medal. Tires are a potent source of raw material. A typical 10 kilo passenger car tire yields 4 liters of oil, 4 kilos of carbon, 2 kilos of steel. And there are 70 kilo truck tires, monster aircraft tires (and an A380 has 22 of them, which get replaced every 300 landings), and though you didn’t ask, Australia’s mining operations utilize a 3.5 metric ton oversize mining dump truck tires. In the case of the latter, Green Distillation Technologies CEO Craig Dunn reckons you can get 1500 liters of oil, 1.5 tonnes of carbon, as well as the steel reinforcing. What do you do with the materials? The steel? That’s returned to the supply chain. The carbon? Carbon black is one of the world’s most widely used chemical building blocks. It’s used in plastics and paints, water filtration, printing ink, paint, electrodes, graphene, toothpaste and cosmetics including eyeliner, mascara, nail polish, eye shadow, blushes, rouge and lipstick. The oil? It’s a light low sulphur crude that can be refined into bio jet fuel, and Southern Oil is doing that, as we reported in June when Queensland’s premier inaugurated Southern Oil’s $18 million advanced biofuel pilot project in Gladstone. The facility will produce renewable diesel and power with an aim of supplying 1 million liters of fuel within three years for trials by the US Navy, Australian Defense Forces and potentially even for aviation and heavy road transport. How does recycled tire oil perform as a feedstock? 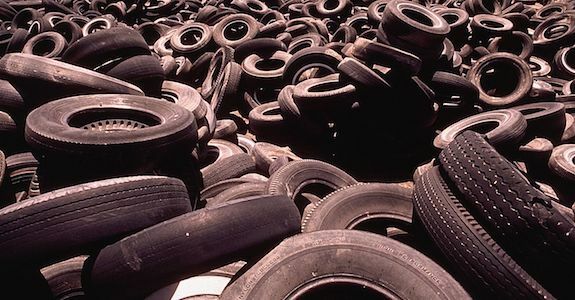 “The Hyder Report in 2013-14 estimated that there are 155,000 tonnes of OTR end-of-life tires of various sizes generated in Australia each year of which 79.4 per cent are left on site as there are no means of recycling them. “We are currently building a test plant to process these tires as although our recycling technology is proven” said Rose. “we have to work out the logistics of how to handle these extra-large ‘off the road’ tires (OTRs) used by heavy duty mining dump trucks, large agricultural tractors and road making equipment. “We have operated this pilot plant in Warren since 2009 and the upgrade to full production will see it capable of processing 19,000 tonnes, or a mix of 658,000 car and truck tires per year. This represents approximately 3% of the 24 million end-of-life tires that are generated in Australia each year,” Dunn added..
How many tires are out there? 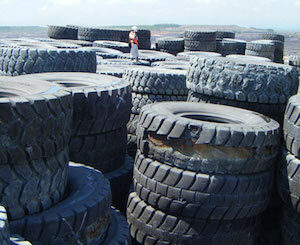 As many as one billion scrap tires are discarded each year around the world. Billions then, must be stranded in landfills, swamps, tire cemeteries. Aggregating all those may well be a lost cause. My, my. That’s enough used tire to support 16 million gallons (62 million liters) of fuel production each year — and that’s a single feedstock stream, and a small country by population. Progress is not limited to regional Australia. The micro-cap company Green EnviroTech is also targeting scrap tires, with a proprietary technology that produces carbon black as a pioneer product, which it estimates has a global market that will reach $20.4B by 2022. Green EnviroTech is working on three US projects: a carbon finishing plant in Ironton, Ohio, and two tire processing plants in Texas. CEO Chris Bowers forecasts that the carbon finishing plant, currently under construction, will be operating in Q2 of 2018. Also, they have been working with an established tire recycler to build a third tire processing plant, in Maryland, with a target of 100 tons per day. More on that here. In the end, depends entirely on companies such as Southern Oil and states like Queensland turning their substantial ambitions in the bioeconomy into commercial-scale production. So, we’ll need to wait a while. Now, ‘Wait a while’ is a phrase you’ll hear around the world of innovation, it’s always in the air, and especially in the bioeconomy. We’re developing, goes the gentle refrain, wait a while. We’re building, wait a while. We’re raising capital, wait a while. But near Nevertire, “wait-a-while” is something in the air, but metaphor has nothing to do with it. 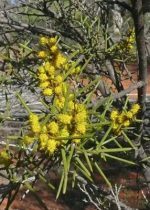 The Wait-a-While is a beautiful and perhaps the most fragrant of all the Aussie wattles, the national flower. It smells like wood, like honey, like vanilla. It’s the scent of the bush and Old Australia, and all you have to do to find it is drive westward out of Sydney’s Big Smoke, and west and west until your compass melts under the bronzing Aussie sun. “West of Dubbo the west begins,” wrote Australia’s bush balladeer Banjo Paterson. You have to wait a while to get there, but it’s worth the wait. So, wait a while. But for sure, the lack of tires in Nevertire is a welcome sight and “Nevertire” is a fair dinkum near-term ambition and slogan for the advanced bioeconomy.